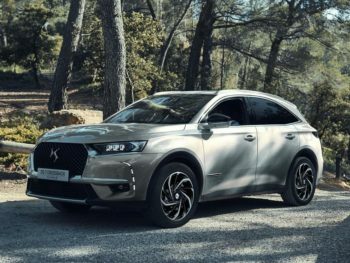 DS Automobiles will add a 296bhp plug-in hybrid to the flagship DS 7 Crossback SUV next year, offering CO2 emissions of under 50g/km on the WLTP test cycle. DS will offer plug-in versions of all future models. The DS 7 Crossback E-Tense 4×4 is one of the eight plug-in hybrids planned by PSA Group over the next two years, alongside the Citroën C5 Aircross, Peugeot 3008 and 508, and Vauxhall and Opel versions of the Grandland X. It uses the more powerful of the two hybrid systems, as used on the 3008, combining a 296bhp petrol engine and electric motors at each axle for four-wheel drive traction. The battery has a capacity of 13.2kWh, providing a range of up to 31 miles (WLTP) and the 6.6kW on-board charger means that can be topped up in less than two hours. Because the platform is designed for a plug-in version, there is no loss of boot or cabin space. For more information, read our prototype drive here.